Gaming firm Zapak Digital Entertainment Limited, a subsidiary of Reliance Entertainment, has launched a new subscription based gaming service called Zapak Plus. Zapak Plus will offer 120 games from international publishers such as Codemasters, Focus Home Interactive, MumboJumbo, Absolutist, iWin etc. "Zapak Plus offers an opportunity to gamers to experience some of the biggest titles in PC gaming at less than Re 1 per month at the comfort of their homes," Rohit Sharma, Chief Executive Officer â€“ Reliance Entertainment (Digital Business) said. Users need to log on to Zapakplus.com to subscribe to their favourite games in full version at Rs. 99 per month. After downloading an app (1 MB), they can download and play games. Zapak Plus offers Cash on Delivery in addition to online payment and the company has set up a casino online cash collection network across 50 cities. Zapak has 8 million registered gamers and interests in online gaming, social gaming, subscription gaming service, gaming cafÃ©s, physical games retail/distribution, MMOG publishing and mobile gaming. 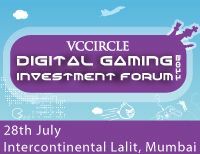 With the sector getting red hot with action, VCCircle is hosting a 'Digital Gaming Investment Forum' on July 28 in Mumbai to deep dive into the opportunities in the anticipated gaming revolution in India. The event will also set the stage for over 150 entrepreneurs, private equity and venture capital investors to unravel exciting business models in gaming. Watch this space for our enhanced coverage of the gaming industry in India.